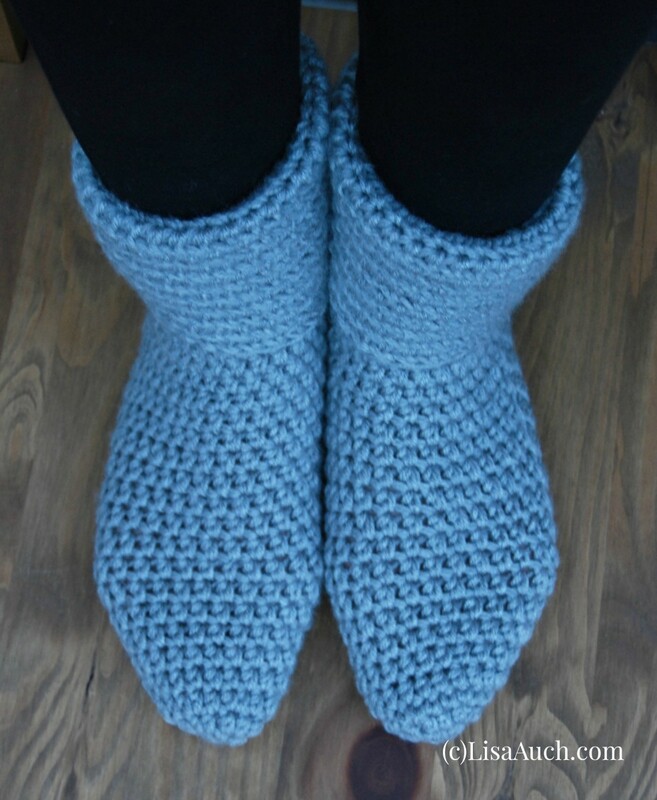 My favorite hobby is crocheting doll clothes. 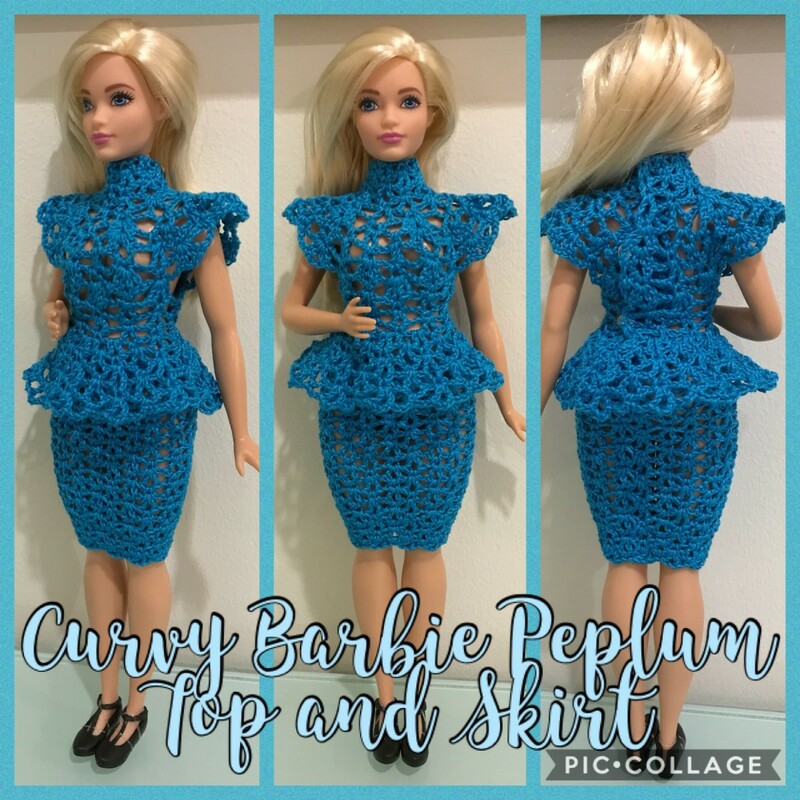 Using what I've learned from reading existing patterns, I create my own designs for Barbie. 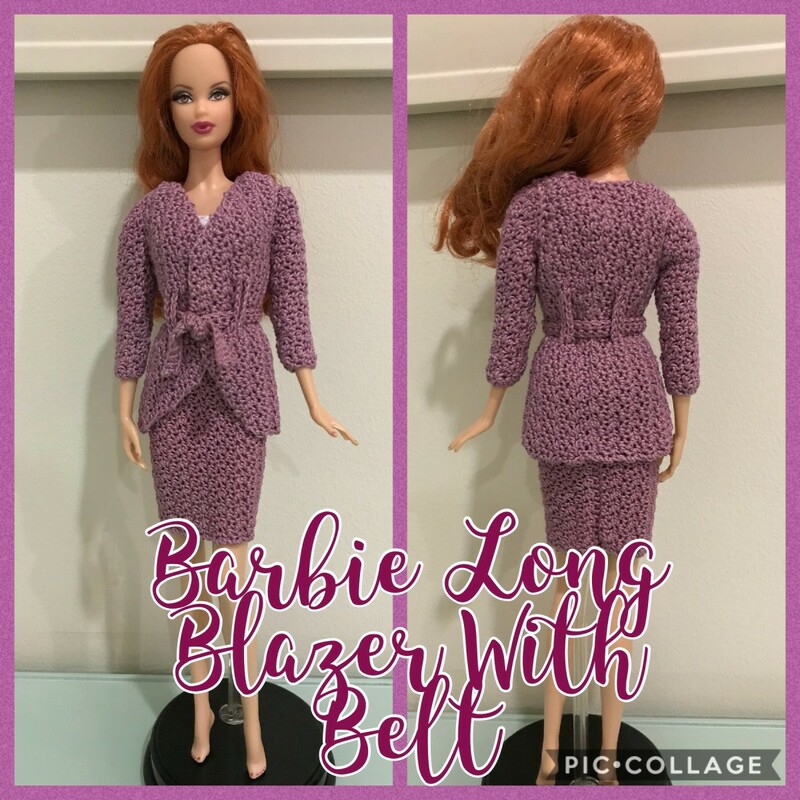 I wanted to make some accessories for Barbie, but I wanted to share it together instead of incorporating it to my other patterns. Hats are generally the same basic pattern, you just need to add some designs to it to make it unique enough to match the outfit. 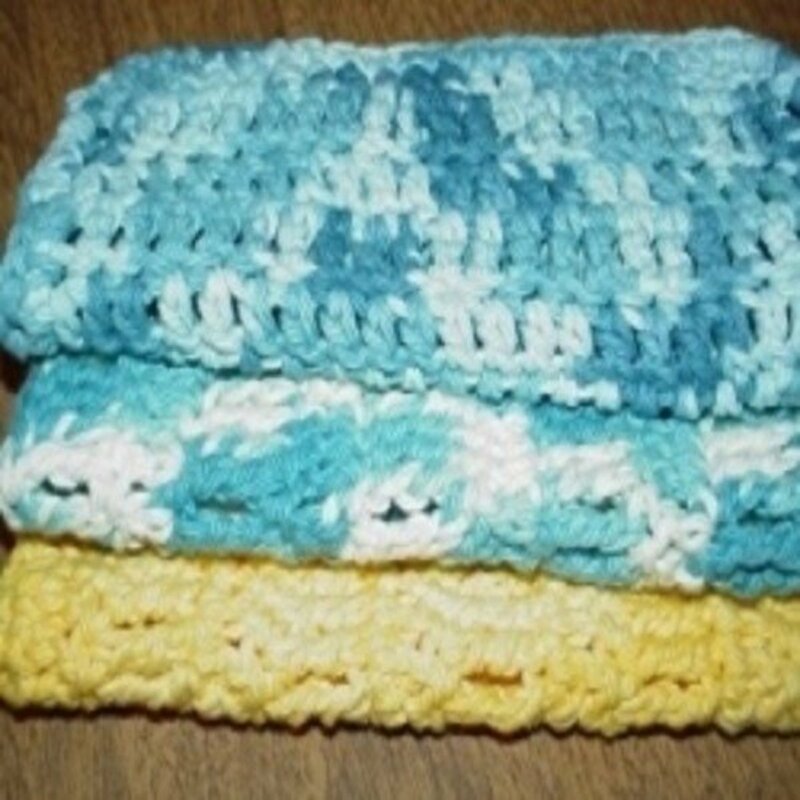 The jacket is done in double crochet stitches, which looks simple enough to be able to match with several other stitch patterns you want to pair it with. 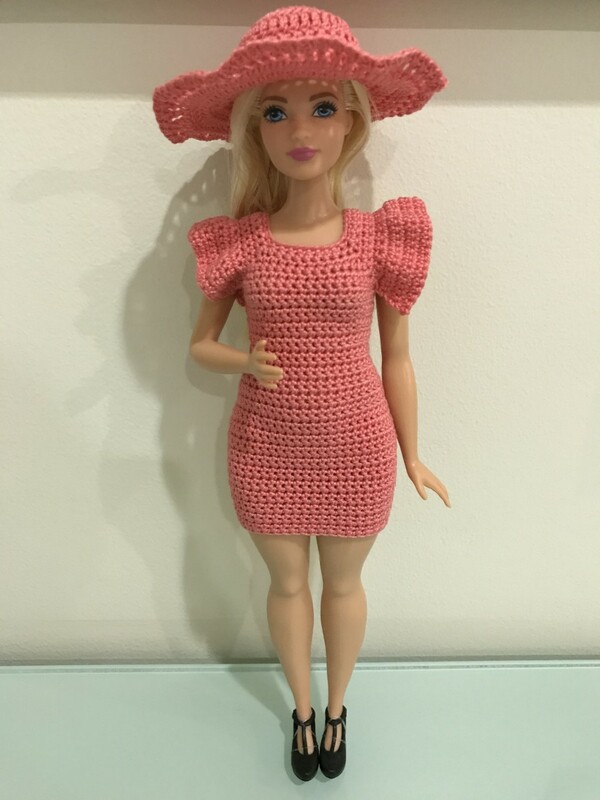 The head for this doll is slightly bigger than the regular Barbies, so if you wanted to adapt the hat for regular Barbies, I suggest using a smaller hook size or getting a smaller gauge than indicated in the pattern. The jacket uses a small button to close the front. 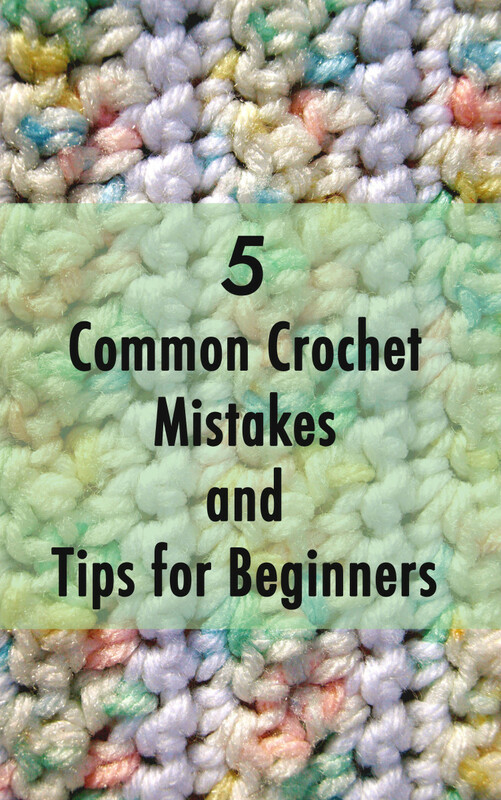 You can opt to remove the button by skipping the instructions for the buttonhole in the pattern. 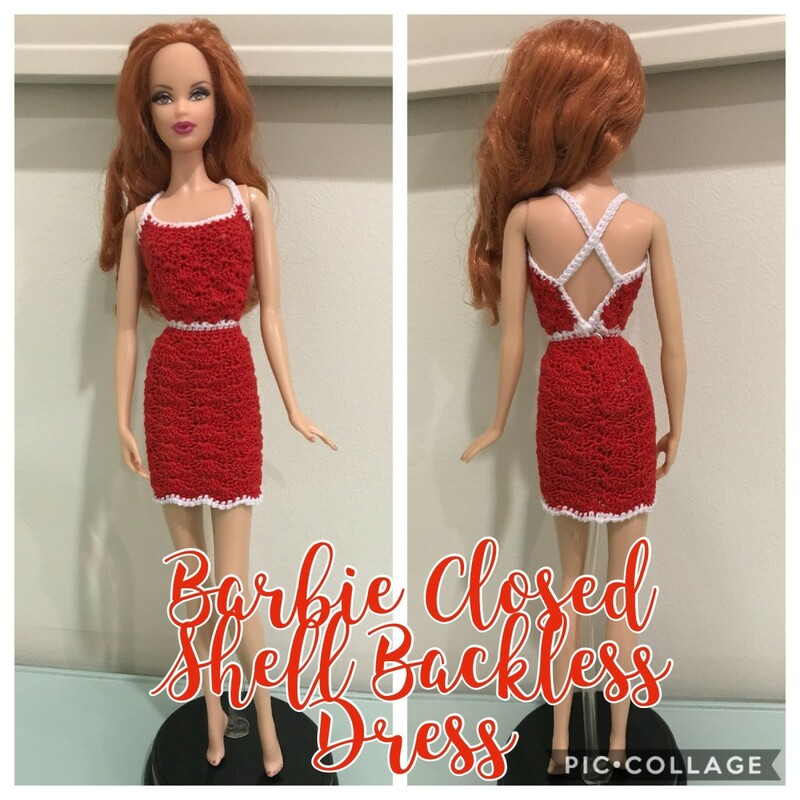 Add snaps to change the look or leave it empty and have an open jacket for your doll. 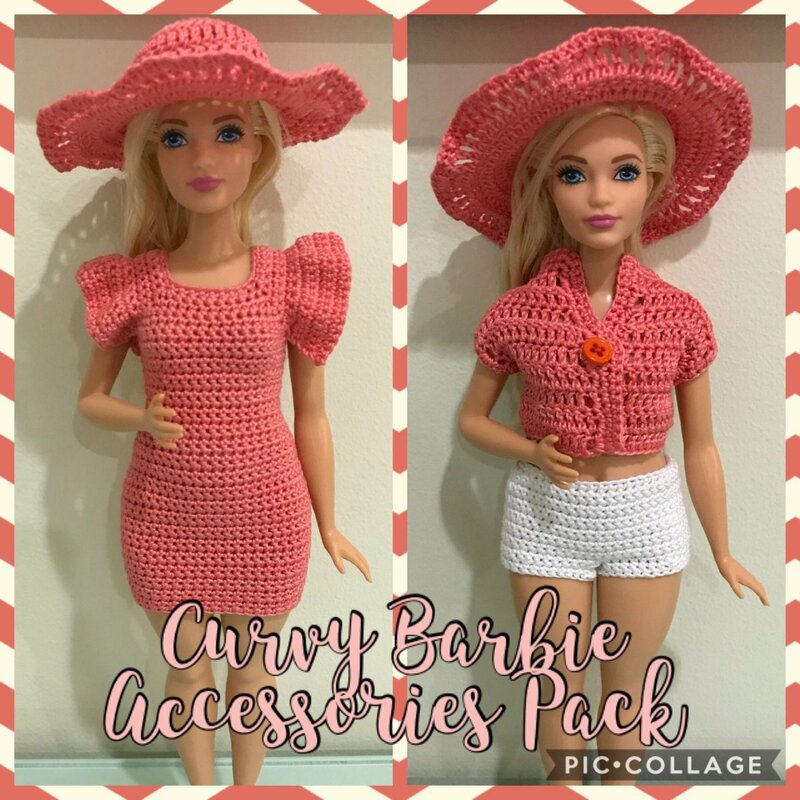 This accessories pack was made specifically for a Curvy Barbie doll. 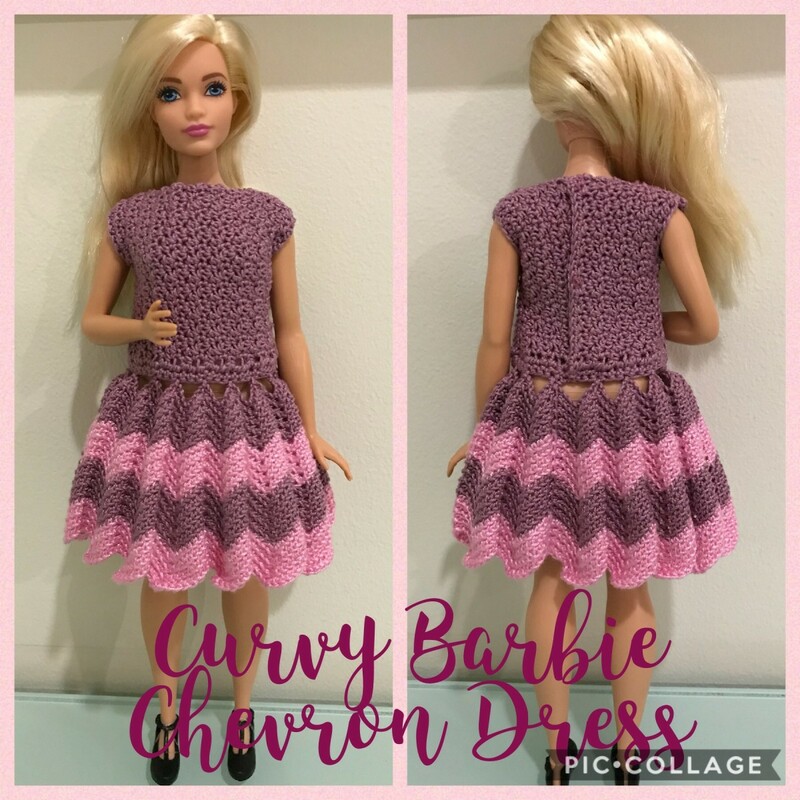 For more information on the different body types of Barbie, please visit Crochet Clothes For Your Barbie Doll. Gauge: 1st 2 Rounds of Hat = 1.25"
Fasten off. Weave in the ends. 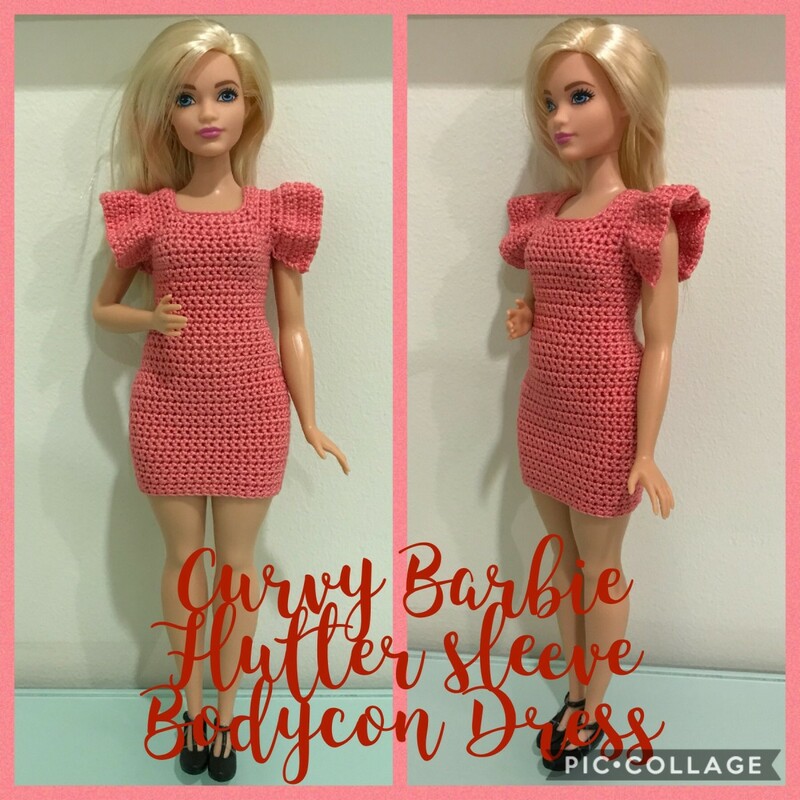 Pair with Curvy Barbie Flutter Sleeve Bodycon Dress to get the complete look in the photo. Row 9: Ch 2, dc in each dc across. With RS and both Fronts facing, insert thread through both thicknesses at the end and work 7 sc to sew the shoulder seam closed. Repeat on the other side, starting from the 7th sc from the end. Fasten off. Step 3: Ch 1, sc in each sc across, work another sc in the last sc from Step 2, work 2 sc for every dc edge up towards Row 9 of the Front, 3 sc in the next dc (corner), sc in each dc across, work 1 sc on each side of the shoulder seam, sc in each dc across, work 1 sc on each side of the shoulder seam, sc in each dc across, work 2 more sc in the last dc (corner), work 2 sc for every dc edge down towards the sts in Step 1, ch 3 (to form buttonhole), sk 2 sc, sc in the remaining sc across, turn. Note: You can change the size of the buttonhole if needed, depending on the size of your button. Add chains or skip more sc's to get a bigger hole. Step 4: Ch 1, sc in each sc around to the opposite side, making sure to work 3 sc in the center stitch of the corners and 1 sc in each ch of the button hole for a total of 3 sc. Fasten off. Work sc evenly around the edges of the sleeve opening to smooth it out. Sl st in the first sc to join. Repeat on the other side. Sew a button to the jacket opposite the buttonhole. 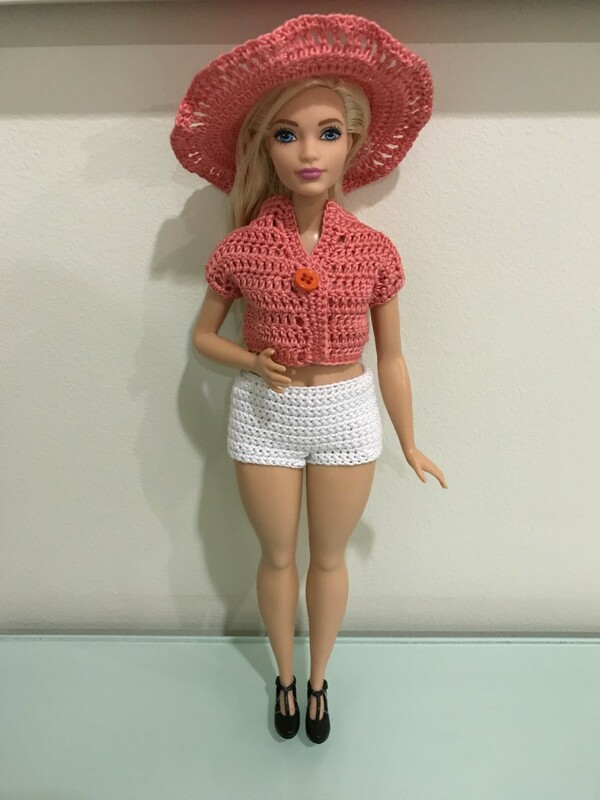 Complete the look by making the Curvy Barbie Shorts.